Brown-headed Cowbirds (Molothrus ater) often remove host eggs, usually to the detriment of the host's reproductive success. We tested the hypothesis that host egg size and number influence the incubation efficiency of a parasitic egg. A single House Sparrow (Passer domesticus) or Brown-headed Cowbird egg was placed in each host nest (addition), and in some nests a host egg was removed as well (addition/removal). Hatching success and incubation length were measured to determine whether host-egg removal conferred an advantage in incubation efficiency compared to simple addition of a parasitic egg. Redwinged Blackbirds (Agelaius phoeniceus) and Chipping Sparrows (Spizella passerina) served as medium-sized and small-sized host species, respectively. In Red-winged Blackbird nests, host-egg removal produced smaller clutches, and parasitic eggs had shorter incubation lengths in smaller clutches. However, the parasitic egg's incubation length and probability of hatching did not differ between the addition and addition/removal treatments. Parasitic eggs in Chipping Sparrow nests had shorter incubation periods than in blackbird nests and frequently caused the inefficient incubation of host eggs. Egg removal again did not reduce incubation lengths or increase hatchability of parasitic eggs. 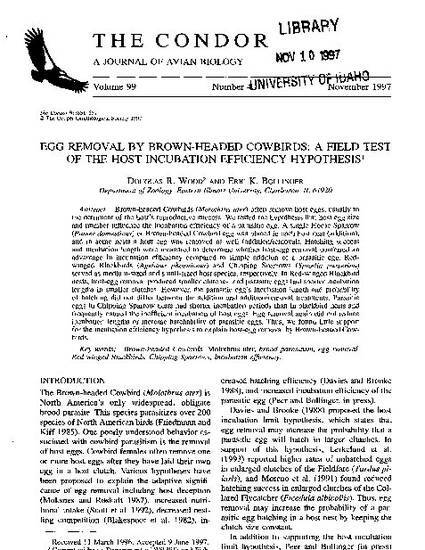 Thus, we found little support for the incubation efficiency hypothesis to explain host-egg removal by Brown-headed Cowbirds.